Tomorrow, the long-awaited Brexit debate will start in the British parliament. For the next few days, Prime Minister Theresa May will try and convince as many colleagues as she can to vote for her quite unpopular ‘Brexit deal’ or face a possible no-deal Brexit. The EU already voted last week and only took 38 minutes to agree on the measure. Given the unpopularity of Ms. May’s deal, however, the UK may need a bit more time. On Tuesday 11 December the British parliament votes on the proposed deal. Pollsters say that the politicians will likely reject Ms. May’s deal which could prove disastrous for the British pound’s value and thus the likely cost of any (foreign) Christmas present that the Brits still need to buy. Related coverage: White House Slams Brexit Agreement: “Sounds Like A Great Deal For The EU”. Just last week, the Bank of England’s chief, Mr. Mark Carney painted a very bleak picture of what would happen to the UK economy if they left the EU without a deal, stating that in case of an unlikely “disorderly no-deal” Brexit, the economy would contract by 8%, house prices would tumble by 30% and interest rates would rise to combat inflation. He also estimated that the pound would drop in value to such an extent that it would be worth less than the US dollar, and thus if the British House of Commons votes against Ms. May’s deal next week, it is forecasted that this fall would start. With a seventh Government minister to resign and the number of Conservative MPs to have spoken out against the prime minister’s plan just passing 100, the chances of the deal passing through parliament appear very slim. ECJ says the UK can revoke Article 50 without permission. Every effort is being made on both sides of the Channel to stop Brexit. 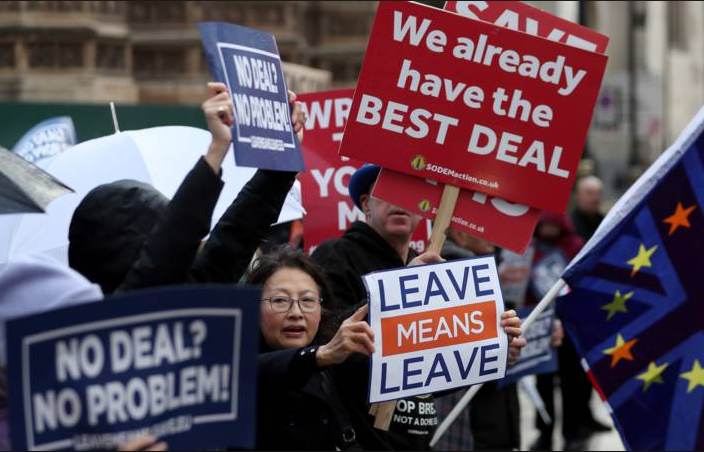 Meanwhile, the currency markets showed how they feel about Brexit when the pound surged higher on the comments from a top European Court of Justice official that the UK could unilaterally change its mind on Brexit. The ECJ’s advocate-general, Mr. Manuel Campos Sanchez-Bordona said Article 50 “allows the unilateral revocation of the notification of the intention to withdraw from the EU”. In other words, if the UK wants to remain in the EU, it can unilaterally decide to do so, which of course would be very shameful after two years of bickering between politicians. GET A BACKBONE PEOPLE. TAKE YOUR BREXIT. YOU DONT NEED A DAMN "BY YOUR LEAVE". CLAIM YOUR SOVEREIGNTY!!!! FIGHT FIGHT FIGHT!! !